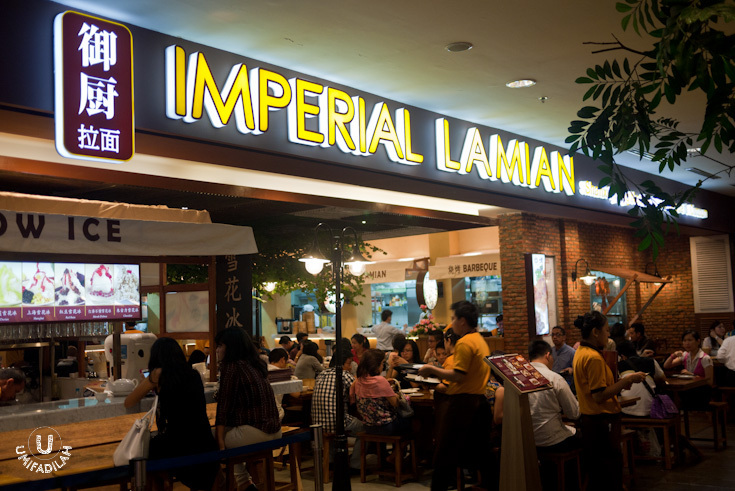 Imperial Lamian Grand Indonesia: Finally, Something Worth Eating at Malls. Well that happened to me quite often. I know the old proverb “Get Lost is Good” – but getting lost inside a mall – overthinking about places to dine is just ridiculous. Walking from East to West, Ground ‘til 5th floor, for me it usually ended up at Food Louvre and suddenly it seems like a win-win solution for everybody. I’ve heard about them since quite a long time, they have this huge outlet in Flavor Bliss, Alam Sutera Tangerang. It’s a good thing that they expand to the center of the city while still managed to keep their prices consistently low. No wonder even if you come here at non-peak hours, say around 10AM or 3PM, some queuing might be at sight. Can’t hardly imagine what it’s like at peak hours, huh? 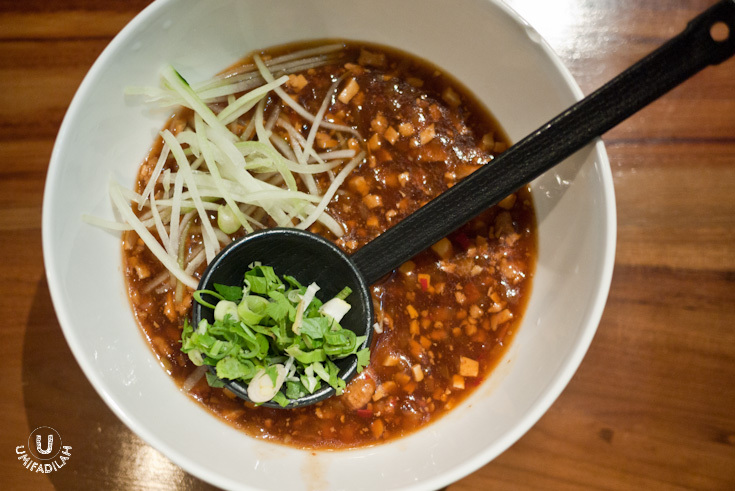 You should also know that Imperial Lamian is famously known for its pork dishes, so you should expect seeing lots of them on the menu. But a waiter told me that they separate the station so I guess if you're okay with that, you can proceed eating with less worry. Not much people are aware of this, but actually there are 4 types of noodle that you can choose from. 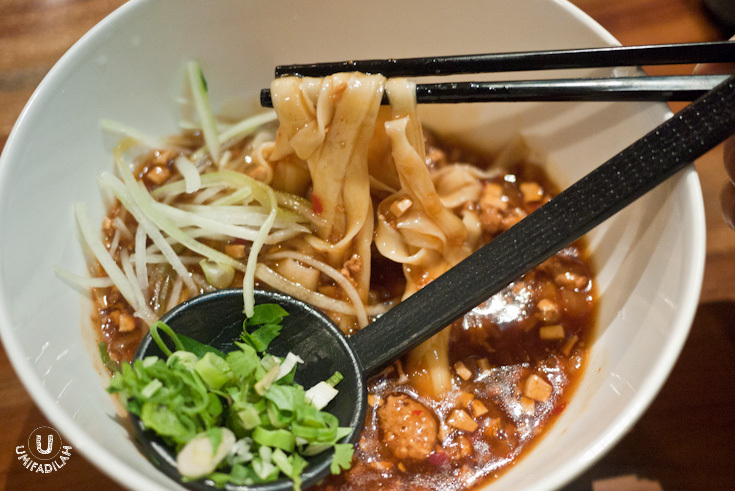 Wide Noodle (Khuan Mian), Flying Noodle (Yi Gen Mian), Sliced Noodle (Dao Xiao Mian), and Regular Noodle (La Mian). Everything’s literal and you might have heard most of them, except for Flying Noodle – a method of preparing noodles commonly used in Shanxi province, China. This Flying Noodle is prepared by pulling then throwing a single, very long strands of noodle into a boiling hot pot. I ordered Shanxi Flying Noodle type, but honestly I doubted if they got my order right, because this looks more like Wide Noodle instead. Err.. well I guess I have to pay a visit again to make sure. Noodle with Stewed Beef Brisket – IDR 34.900. This actually reminds me of Din Tai Fung’s version of beef brisket noodle which cost twice as much; and also DTF version has a clearer broth while this one’s a bit darker and sweeter. 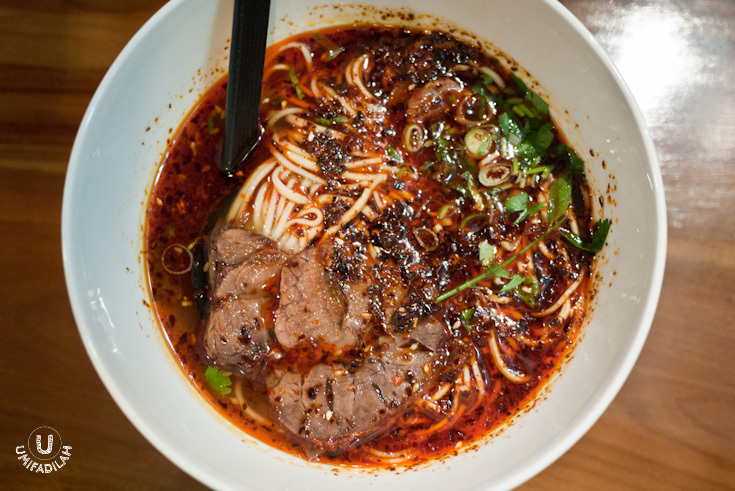 Either way, tasty soup + long strands of chewy noodle + tender beef brisket = I SAY YES. YES. YES. Noodle with Sliced Beef in Chili Oil – IDR 34.900. Can you see the bright red chili oil & flakes floating on top? Haha, it looks exactly fiery as it says. And it is indeed, HOT, people. I prefer these beef slices compared to the previous beef brisket, so if you feel like you can handle hot stuff, then it’s a perfect option for you. Fried Noodle with Egg – IDR 21.900. Okay hear me out first. I don’t know what it is about this particular oh-so-simple noodle & egg dish, but it’s just soooooo… addicting I find myself order takeaways twice in each of my visit. Maybe it’s the chewy and rubbery noodle texture, minimal seasoning, and the super strong wok-hei aroma that just keeps sending signal to my brain to never stop eating it! And it's less than IDR 25k :O Seriously, RECOMMENDED. 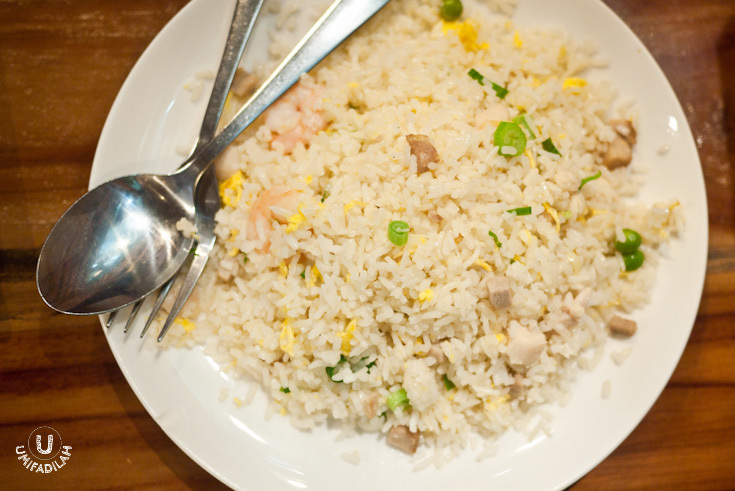 Fried Rice with Seafood & XO Sauce – IDR 26.900. Generous seafood hidden beneath the typical pale looking Chinese fried rice. Don’t let the pale colors fool you, it’s quite tasty but I still think their noodle wins over their rice menu selections. 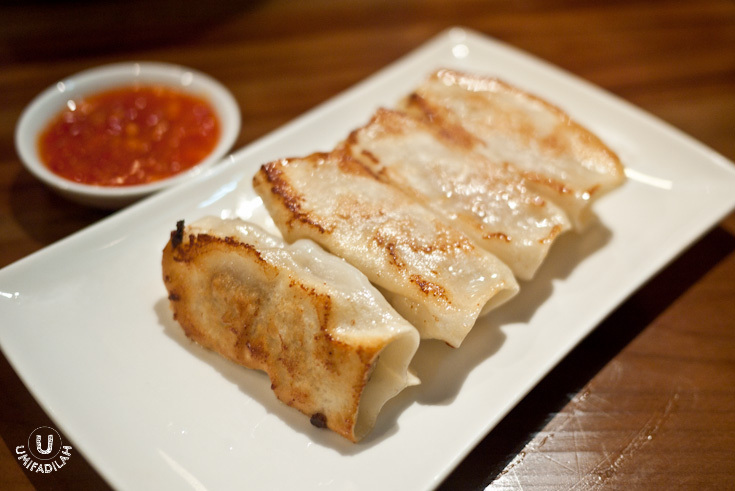 Kuo Tie Ayam / Pan Fried Minced Chicken Dumpling – IDR 14.900. Went there twice, ordered this one twice. Nicely loaded with minced chicken meat, oh and the chili dipping matches well too! 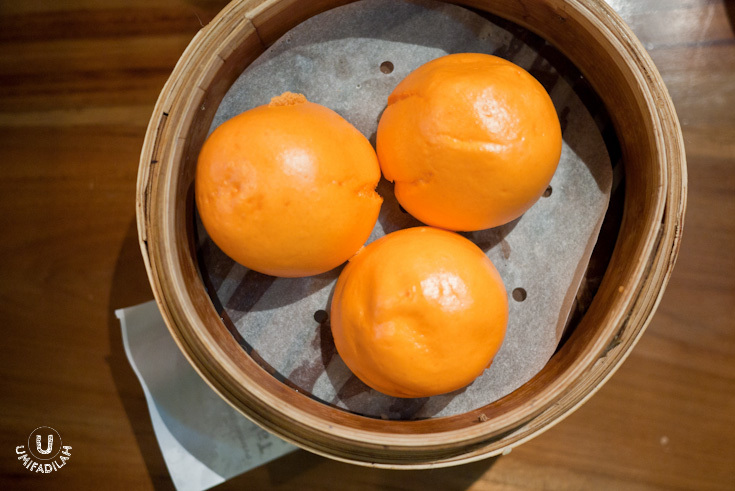 Ba Pao / Steamed Bun with Egg Yolk Filling – IDR 13.900. Not really digging sweet egg yolk bun since I’m more of a savory person, but it was quite nice and fulfilling though. 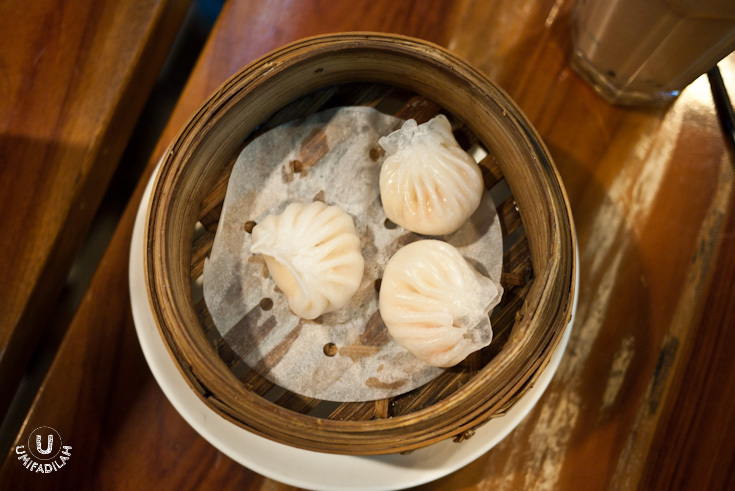 The insides of the steamed bun. Oozing sweet egg yolk mixture! 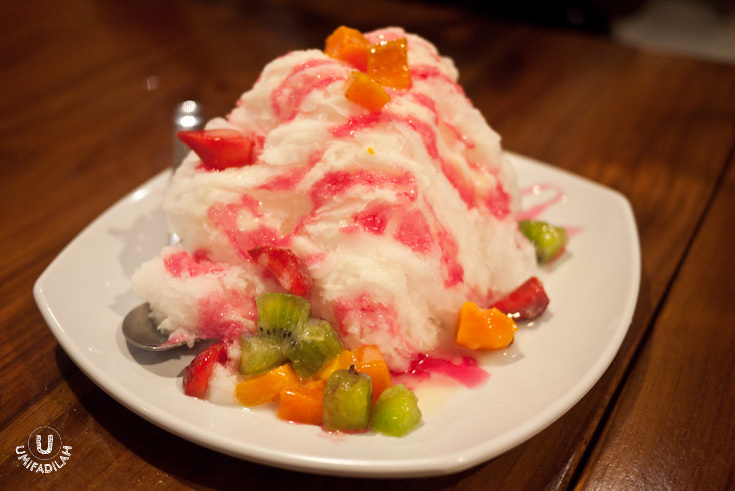 Fruity Snow Ice – IDR 18.900. HUGE portion for a dessert, really. Call me cheapskate but I think at some point we all agree that great foods with reasonable prices score higher points to customer’s overall satisfaction. And I dare you to come to Grand Indonesia and prove the theory yourself. 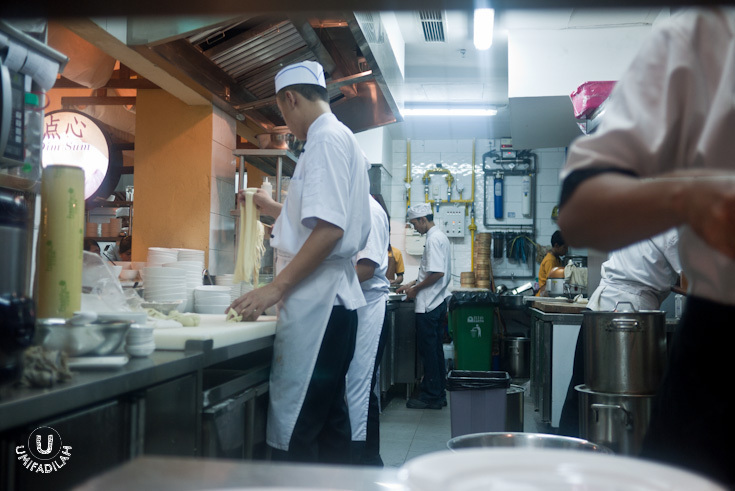 Or at least witness their hectic busy services with long queue at peak meal time.